What a great project! Monrovia identifies and celebrates individuals who have made an impact on their community-- and sometimes the country -- by telling their stories through public art. 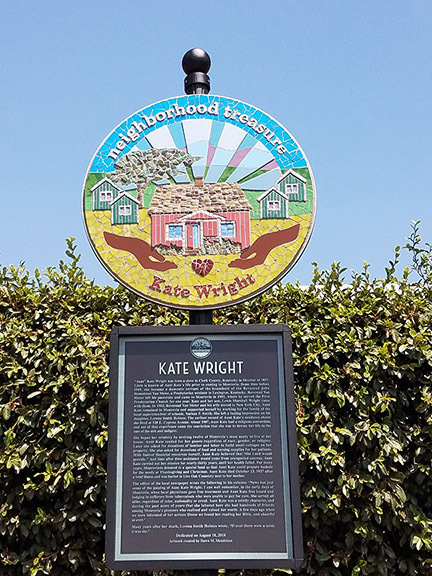 I was so honored to create a piece about Kate Wright, a former slave who dedicated her life to serving others. With help from the community, she built small cottages on her land and took care of people suffering from tuberculosis, who had no family or friend connections. Her commitment to helping others inspired many to step forward and contribute, making the community and the city stronger. Irvine Fine Arts Center Beautification Project Complete! I am working with a wonderful group of new and experienced artists in Irvine, creating a community mosaic project for their Fine Arts Center. We are bringing some color to the entryway by creating mosaic panels for the planters and trash receptacles. The project is structured like a workshop, so students can participate, and also learn the process for themselves. Second session starts in May!